What kinda dinosaur did Mattel cook up in that lab? Well, we’ll be finding out sooner than expected! The upcoming Destroy ‘N Devour Indominus Rex is arguably one of the most anticipated toy releases from Mattel’s Jurassic World toy line. Originally slated for release in the Fall 2019 retail window, the expected ship date on sites like Entertainment Earth and Amazon where the figure was up for preorder was listed as July. 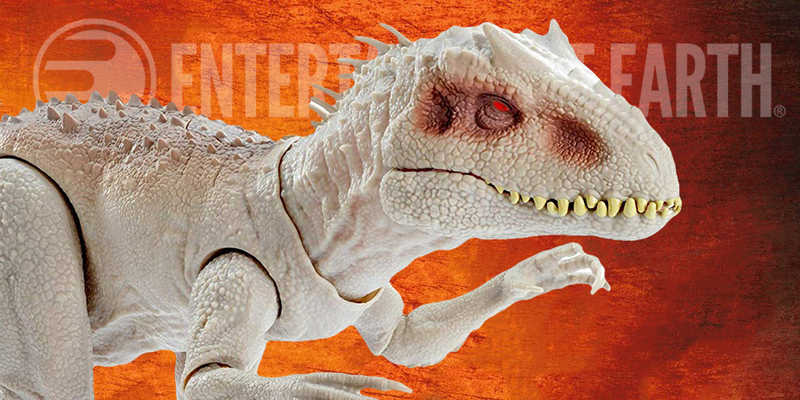 However Entertainment Earth has moved up their shipping date nearly 2 months to May, meaning the Indominus Rex will be destroying and devouring its way into many collector’s hands very soon! This isn’t the first time Entertainment Earth has scored an early lead on Jurassic toys—the Bite ‘N Fight T. rex enjoyed a similar advanced release on the website well ahead of other retailers. Check out our impressions of the Indominus Rex from the Toy Fair, and if you still haven’t preordered this excellent looking figure, head to the link below! Wonder if this means the toy will be hitting retailers around the same time. Was hoping to have the time to save up for it over the next few months, but it shouldn’t be too hard for me to save up the dough to acquire this as soon as I find it in stores, if it sees release earlier than expected. EE’s lead should be earlier than other online retailers, and probably significantly earlier than brick and mortar stores. That’d definitely be far preferable for me to allow time to save up for it. I recall Entertainment Earth’s prices can be somewhat higher much of the time, so I’d gladly wait for the I-Rex to hit stores at a lower price and by then having the cash for it.